Located in the Simi Valley northwest of Los Angeles, Pure Vision was founded by Steve Strope from New York who moved to California to fulfill his dream of working with hot rods. His love for cars with big engines commenced in his youth, when he fell in love with a 1968 Road Runner. 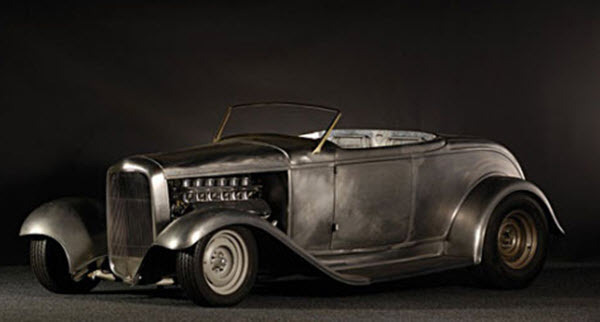 Pure Vision works with a wide range of cars, including hot rods, street rods and muscle cars. They have skillfully restored or customized Fords, Lincolns, Mercury, Pontiacs, Buicks, Oldsmobiles, Chevrolets, Plymouths, Chryslers, and more.The main focus for Pure Vision is American cars from the 1960’s and 1970s, but they do other cars as well. Pure Vision specializes in full design, concept and build projects, but they also do smaller stuffs such as maintenance work, adding engines, installing after-market bolt-on parts, etc. They don’t do upholstery and paint jobs, but they work together with carefully selected third-party companies to get these things done for their customers. One of the most famous of their projects is the Pure Vision 1967 Ford Fairlane that won the Ford Best of Show at SEMA 2014. Another well-known car from Pure Vision is the 1000+ hp twin-turbo 1972 Camaro that was awarded with a 2013 GM Design Award. For Anvil Auto, Pure Vision modified a 1969 Mustang SportsRoof by completely reinvent the chassis to make room for a remote-mounted coilover JME SLA-style front suspension with Flaming River electric steering and Maier Racing’s torque arm rear suspension. Unsurprisingly, carbon-fiber body panels from Anvil were utilized. For the wider audience, Pure Vision is arguably most famous for the episode of TLC:s “RIDES” that was devoted solely to Pure Vision. Pure Vision also have their own line of die-cast cars with Mattel’s Hot Wheels™ brand. During recent years, many of Pure Visions customers have become less interested in super-showy cars with oversized wheels and unorthodox proportions, and more likely to focus on performance and time-honored configurations. The so called “sweetheart cars” have also become increasingly popular, affordable bolt-ons in a style that was available in the 1960s and 1970s, and usually paired with an OEM engine.